Kiosks and carts are becoming quite popular and incredibly profitable for many small business owners. Once considered an option for only low-end markets, these small and mobile storefront options are now frequently seen in upscale markets as well. The appeal of kiosks and carts is that they are relatively easy to set up, low maintenance, highly accessible to a very targeted buying audience and are less expensive than opening up a retail storefront. If you’re thinking of starting a kiosk business of your own, consider some of the most common and successful ideas and product options available. The most popular products for these types of kiosks and carts are familiar staples: popcorn, peanuts, ice cream, hot dogs, pretzels and gourmet donuts or coffee. With the fresh aroma of the tasty treats wafting through high-traffic areas, customers have a hard time walking past your kiosk without stopping for a treat. The beauty of these kiosks is that customers can browse a catchy collection of jewelry, scarves, handbags or even customized orders that involve silk screening or airbrushing on T-shirts, sweatshirts, sweaters, and just about every other kind of clothing. Cheaper products such as costume jewelry are perfect for young buyers while more upscale products such as silver or gold jewelry are well-suited for high-end shopping centers. If you have a unique type of gift, handicraft, or specialty item, a kiosk is a great way to present these items by themselves, instead of having customers miss them as part of a larger, in-store display. 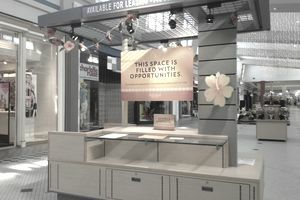 Additionally, if your customers need to be educated to understand the uniqueness of your merchandise, a kiosk is an excellent setting for a quick, in-person infomercial delivered by yourself or an employee. Sunglasses and other types of ornamental eyewear are almost universally-loved products which do well in a kiosk or cart. These items appeal to both low- and high-income shoppers and do well in mainstream as well as upscale retail centers. Cell phones, phone accessories, and other types of electronics are right at home displayed in a high-traffic area. In malls, inventory should be narrowed to the low end of the price range. Since many kiosk and cart purchases are impulse buys, having your customer think twice about the price is something you want to avoid. Beauty products have traditionally been avoided by retailers at high-end shopping centers but are finding more in-roads as merchants realize their value. They’re great testing grounds for new products or ideas, and consumers are accustomed to kiosk merchants selling unusual or newer products. This market is almost exclusively female, and visual appeal is the key to success. Not all kiosks sell products. Many are merely informational booths, in the hopes that the passersby will buy the real product or service later on. Some more common businesses taking advantage of the traffic and interest kiosks generate include time-shares, dealerships, and leisure-living businesses. Due to the nature of the eventual wares sold, higher-end venues are the best locations for these kiosks. Which Countries Import the Most U.S. Goods and Services Annually?